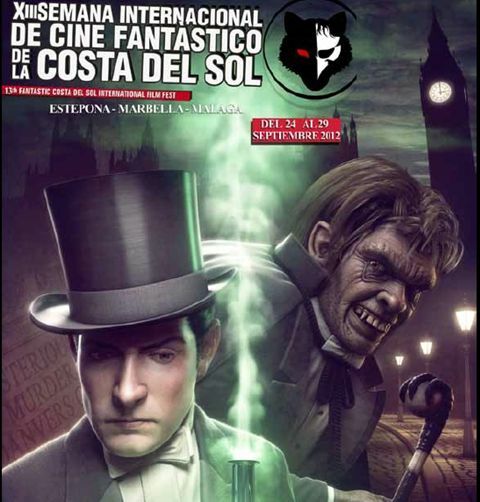 From 24 to 29 September, Estepona presents the thirteenth edition of the XIII Costa del Sol Fantasy Film Festival with Robert Louis Stevensons 1886 novel on man’s inner conflict between good and evil “The Strange Case of Doctor Jekyll and Mr Hyde” providing this year’s theme. There are a wide range of activities and screenings with a number of prestigious awards up for grabs. Screenings take place in four centres with the Palacio de Congresos in Estepona being the many venue, followed by the Padre Manuel Cultural Centre in Estepona, Marbella’s Centro Cultural Cortijo Miraflores, and the Area de Cultura, Calle Ollerias, in Malaga. Here is the programme as published by the event organisers. Please note that due to the nature of such events this programme could be subject to last minute changes! Entry to all the screenings is free of charge. 8.30 pm – Opening ceremony at the Palacio de Congresos where you can get into the spirit of the Jekyll and Hyde theme in the Victorian street which has been created inside the building. This Spanish film tells the story of Lucy (Nathalie Le Gosles), a beautiful young woman who has a passionate and bloody affair with Dracula (Javier Caffarena). Van Helsing (Paul Lapidus) a vampire expert tries to save Lucy from the clutches of the vampire. Many years later, after the nine eclipses, Lucy suffers from a strange amnesia and begins to realize her true nature and remember everything that happened, while beginning to notice that gradually she is developing a thirst for blood. Will Van Helsing rescue Lucy? Will you lose something along the way? Will Lucy achieve her dream, to live eternally with Dracula? This Thai gorefest is set on a movie set where a hot-tempered superstar named Rashane has a quarrel with several members of the movie crew. The quarrel leads to the unexpected death of Rashane, but the horror doesn’t end there, when Rashane’s corpse is summoned from the grave to get his bloody revenge. A brilliant young boy’s chance encounter with a Professor leads to a fascination with the theory of bending time. A tragic event inspires him to dedicate his life to turning the Professor’s theories into reality. From France comes CALIBRE 9: In a French town riddled with corruption, Yann, a naive urban planner comes into ownership of a 9mm handgun possessed by the soul of Sarah, a murdered prostitute. Together they will eliminate the criminals one by one, restoring order in the city by hunting down the man at the head of the pact of corruption, the mayor himself. Festival regular Albert Pyun presents this adaptation of H.P Lovecraft’s spinechiller. Randolph Carter moves into a squalid boarding house in the summer of 1925 where he becomes friends with a mysterious doctor who revives him after a near-fatal heart attack. Soon after, Carter discovers the awful truth about the doctor and the fragile line that separates life and death. Adultery, a family secret, a serial murderer. A roller coaster of a plot built like Russian dolls. The viewer looks for a railing to cling to, but only finds knives. A heart-pounding suspense thriller, set on an isolated farm in England’s beautiful, rugged Peak District. Cassie Naylor kills her husband to protect her daughters from him. Eight months later, when the charming drifter, Aden turns up, her terrible secret comes back to haunt her in the most horrifying and unexpected way. Chillerama is a 2011 horror comedy anthology film consisting of four stories that take place at an old school drive-in playing monster movies. Each segment is a homage to a different genre and style. Horror and science fiction collide in the adventure of Albert Wilmarth, a folklore professor at Miskatonic University, as he investigates legends of strange creatures rumored to dwell in the most remote mountains of Vermont. Wilmarths investigation leads him to a discovery of horrors quite beyond anything he ever imagined, and ends in a desperate attempt to escape the remote New England hills with his life and sanity intact.